Another bit of lore about BCSD you often hear is “We have a district that ranks in the top 5 regionally by graduation rates. In fact, we consistently rank at the top in the state of Idaho, with a graduation rate consistently over 90%”. Graduation rate IS a great metric for how high schools deliver good outcomes for their entire student bodies, and it’s a closely-followed statistic in the education community. It’s also a statistic that traditionally has NOT had a uniform algorithm to track it, with different states and districts adopting various measures. That is changing for 2012, with a mandate under Race-to-the-Top regarding graduation rate, and a uniform measure for it being instituted nationwide. The Gates Foundation (Bill Gates’ non-profit founded to advance education issues) has led the way in this effort. In fact, they’ve already been tracking graduation rates for districts across the US, using consistent measures for how kids enter high schools and matriculate. Would you be surprised to learn that, using the Gates national indices, the BCSD graduation rates haven’t been running above 90%, but rather in the low 70%s? Although some of this difference may be due to the variations in algorithms (The Gates Foundation looks at the entirety of the high school experience, over four years, of who entered and what their outcomes were for diploma, GED, special programs and dropping out. ), the Gates Foundation does apply it consistently to all districts in the country. The net is that in 2008, while BCSD showed a graduation rate of 71%, the state average was over 75%, Pocatello was over 85% and Boise District was in excess of 84%. By nationally-accepted measures, the BCSD graduation rates are not over 90% and certainly not among the best in the state. Because the databases are so interactive, it’s possible to browse and get a sense of trends by region. This explanation generally serves to address the question to a degree and the subject is quickly changed. And, on first blush, the ‘explanation’ sort of makes sense. That is until you test the underlying hypothesis, especially as “kids taking the SAT” is a pretty self-selected group. And, once you apply further scrutiny you find the explanation has got a few holes in it. For starters, WRHS is hardly the only school in the state with higher percentages of kids opting for the SAT. Boise District’s high schools all have high rates of SAT participation and all those schools score much higher than BCSD on all SAT sections, across the board. Coeur d’Alene Academy annually has well over 50% of their kids take the SAT and generally delivers results of 100 points higher. Per section. That is a lot, especially since the standard deviation for BCSD is in the ’90s’. 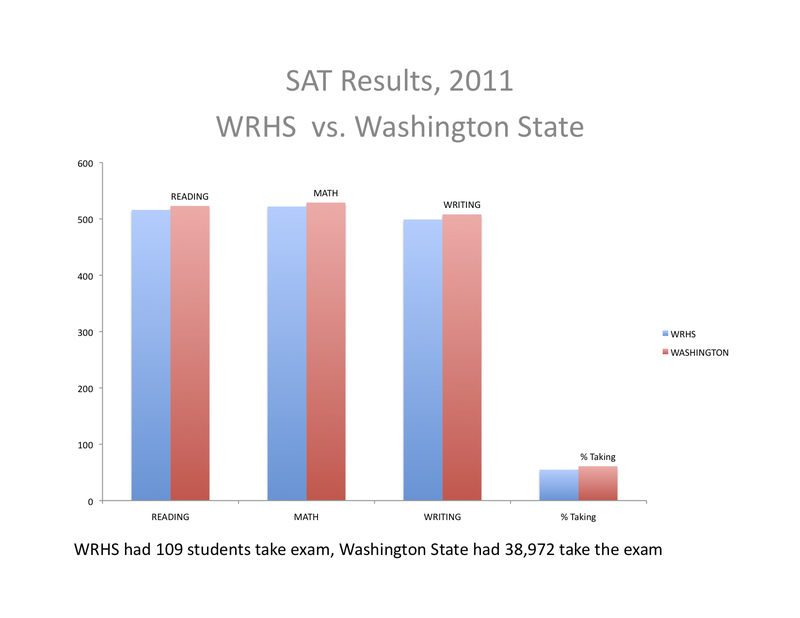 Washington State’s average SAT Scores for 2011 compared to WRHS. Across the board, the averages for Washington state, in its ENTIRETY, outpaced BCSD, the presumed “best school district in Idaho”. Seven points higher in Math, seven in Critical Reading and nine points higher on the Writing section. Clearly, there is more to the issue than simply “the percentage of kids taking the test annually” if other states can have higher-percentage participation and yet deliver higher average results. There’s even more to the story, once one starts to dig into the demographics, and the news is not exactly good. But, more on that later. I noted with considerable amusement the comments by Mr. Guthrie and Dr. Barber in last week’s rebuttal to the Mountain Express editorial about the McKinstry debacle: School District did the right thing.